The Museum has precisely 366 coal ball slides in the collection. Known as the D.M.S. 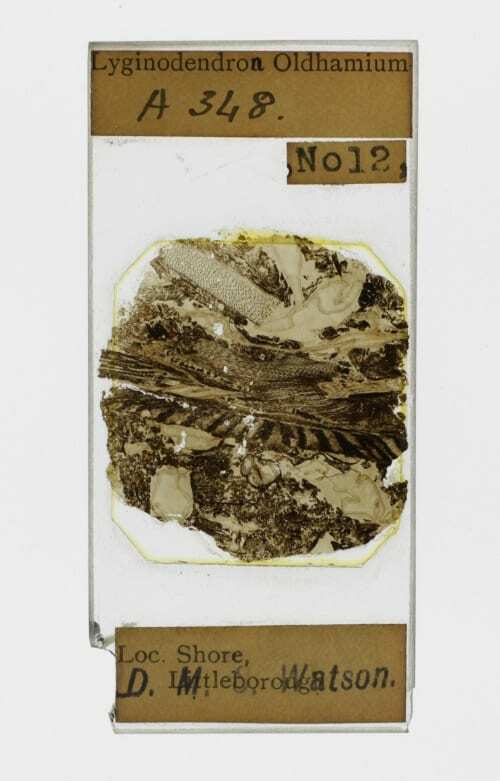 Watson Coal Ball Slides, these are thin sections of fossil plant material taken from petrified coal concretions formed in coal seams. These ‘coal balls’ are formed when plant material becomes mineralised instead of changing into coal. Either collected for or prepared by former Grant Museum curator D.M.S. Watson, most slides have his name stamped upon them. Some slides include dates which range from 1903-1912. They were collected from coal mine localities in England and Scotland. So how are these slides connected to Marie Stopes? Marie Stopes in her laboratory 1904. Image © Marie Stopes International Australia. Marie Stopes (1880-1958) began her university education at UCL in 1900 and after just two years (attending both day and night school), graduating with a BSc in botany and geology and winning the gold medal for botany. Continuing her studies at UCL, she was awarded a DSc degree in 1903 – the youngest person in Britain to have done so. She was then invited by her botany tutor Professor Francis Wall Oliver to serve as research assistant on his pioneering research on plant evolution – the discovery that the fern-like plants in the Coal Measures were seed-bearning plants and not ferns, changed our understanding of the early evolution of land plants 1. Stopes contributed to this work identifying specimens proving the connection of seeds to the fern fronds 2. Igniting a love of scientific research from this experience, Marie Stopes then studied the reproduction of cycads at the University of Munich, earning a PhD after only 10 months, defending her doctorate in German. Her PhD in-hand, she returned to the UK and became the first female academic at Manchester University in 1904. Here, in the nearby coal mines, she collected nodules of coal that contained remains of extinct plants. Working with her undergraduate student David Meredith Seares Watson using slides like these, they wrote a highly influential paper in 1907 (published by the Royal Society in 1909) which made major contributions to knowledge of earliest angiosperms (flowering plants), the formation of coal balls and the nature of coal macerels 3. 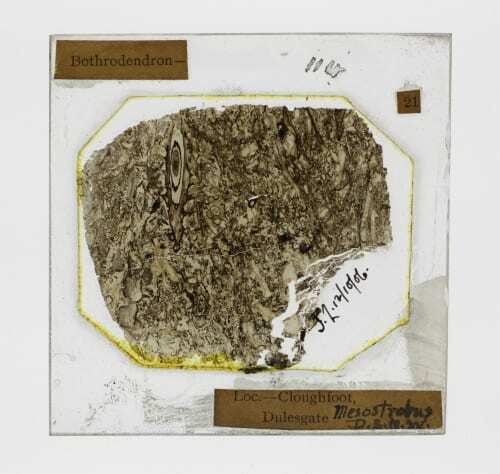 Although the slides figured in Stopes and Watson’s paper are held in Manchester, it is very likely that the Grant Museum coal ball slides informed this research given that they belonged to Watson and were collected at the same locations and at the same time as the Manchester slides. Perhaps they are duplicate thin sections from original specimens. Notes accompanying the Grant Museum D.M.S. 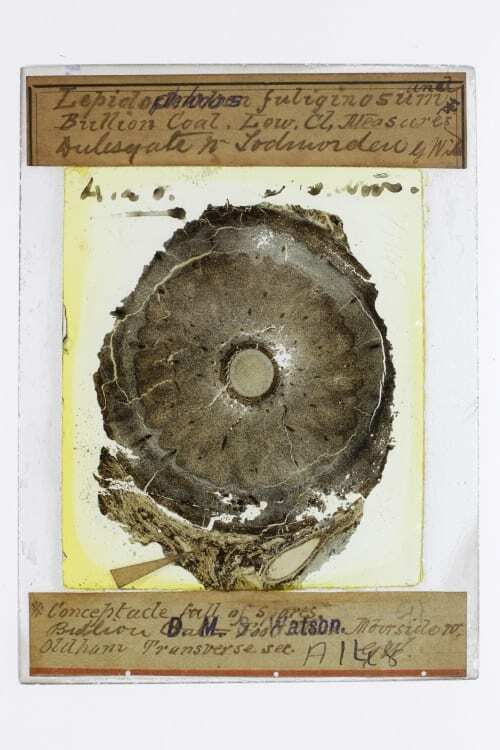 Watson coal ball slides state that many have been figured in various palaeobotany papers and several are labelled as holotype or cotype material. 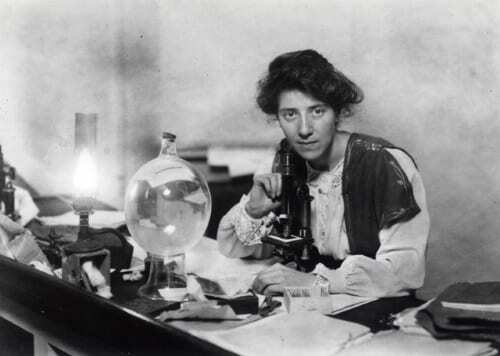 Marie Stopes later conducted research of fossil plants from coal mines in Japan and studied fossil ferns in Canada. During WW1, she returned to Britain (and her work on coal) devising the classification scheme and terminology for coal which is still used today. She published widely and was recognised as one of the leading palaeobotanists of her time. Following the war, Marie Stopes would become famous in her next career as an activist for women’s rights but should be equally recognised for her significant contributions to palaeobotany and coal classification. 3. Stopes, Marie C. and D.M.S. Watson. 1909. ‘On the Present Distribution and Origin of the Calcareous Concretions in Coal Seams, Known as “Coal Balls”’. Philosophical Transactions of the Royal Society of London. Series B, Containing Papers of a Biological Character. Vol. 200 (1909), pp. 167-218.